I WONT’ LET YOU DOWN! This week it got a lot colder outside, I fell on really hard ice two times, and I was assigned my first big project. And, yes, I am having the time of my life. On Sunday evening I received a text from my boss that stated, “Are you ready for your first big project?” I immediately responded with my confirmation and she went on to tell me that this project will be, “super important for the growth of the company,” and will give me, “a good taste of the PR world of sports.” The pressure was on and I assured her I would not let her down. The details of the project required me to do one of my absolute favorite things as a professional: network. I am currently in the process of striving to connect one of our clients with a huge range of online media outlets (i.e. Forbes, CBS Sports, etc.) in order to grow their brand and get their name out there. In one day I was able to obtain 14 different contacts and I left work feeling very confident. The only struggle I found with this particular task was the strain between my ranking in this profession and the rank of the profound writers and business people associated with these outlets. However, I stopped to remind myself that that is exactly why I’m here and doing what I am doing. Building a rank and a name for myself takes time and I am certain that the people I am meeting and surrounding myself with in this industry will help me do just that. One thing I love about this company is that we, as part of a team, aim to establish a genuine relationship with the people we work and associate ourselves with. For example, a meeting I got to be a part of this week included a man from London who was a longtime friend of my boss and had the potential to really help LW Branding. Instead of having the entirety of the meeting surround simply making connections, we all sat around for awhile and talked about everything from personal to professional life. It’s a comforting and effective way to do business. Besides having a wonderful time at my place of work, I also ha d a blast doing something I am actually terrible at. 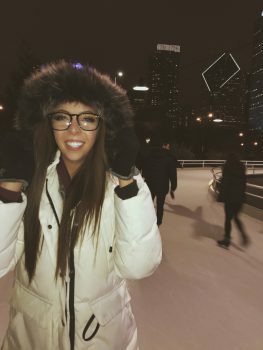 On Tuesday of this week, my roommates and I went to Maggie Daley Park and went ice skating. On the way over, I recalled the last time I went ice skating was in middle school which prompted me to become a little nervous. Of course I got on the rink and hardly let go of the rail the entire time. I fell not once, but TWICE and it was equally parts embarrassing and painful. Yet again, I still had a blast. We laughed and took pictures and it has to be one of my favorite times so far. My next goal for myself is to continue to make connections and make my boss proud by flawlessly executing this project.